To change display views for an Edit window track, use the left-hand pull-down menu, under the track name, to switch from “waveform” to “volume” or another mode. 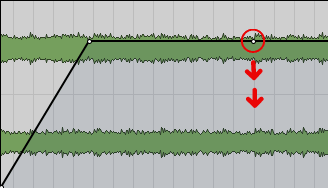 The default “volume” is a horizontal line, at 0dB, indicating “unity gain” — no boost or cut to the volume of the clip. You can then automate the volume of a track’s playback by clicking in the region, with the Grabber tool selected, to make new “breakpoints.” Dragging a breakpoint up or down adjusts the volume level of the track’s output — like turning a volume knob. Option-click on a breakpoint to delete it (again with the Grabber). Drawing with the Pencil tool creates a dense stream of points that follows the line you draw freehand. Selecting a range of points with the Selector tool allows you to delete or copy the selected volume automation. When a range of points is selected, the Trimmer tool can be used to raise or lower all selected points, preserving the shape of the volume envelop. Adjusting volume breakpoints simulates moving a track’s volume fader on a mixer. Using the volume displays lets you see visual cues in the waveform for aligning the volume (or other parameter) at exact places and levels in the audio. A typical adjustment would be to drag a music bed down, often about 12-15dB, under a voice. Start the duck before the voice-over, then continue fading a bit under the start of the voice — this makes the transition smooth. A straight-line linear drop in volume often sounds a bit mechanical, so add more breakpoints, then create a curved, more natural sounding duck. The “best” shape of the volume change depends on audio material and personal taste, but often, gentler curves sound better. Don’t be afraid to make long, gradual adjustments over many seconds, even minutes — i.e., not just for short ducks or boosts. You can adjust the volume automation of any track, including aux channels and master faders. Making volume adjustments to those grouped channels can be a real time-saver. Selecting a range of breakpoints lets you delete them (with the delete key). With the Trimmer tool, you can select, then drag multiple breakpoints up or down to raise or lower them all, while preserving their volume shape. When you move or delete audio regions, their automation data should move with them. Unfortunately automation may glitch during large structure changes. So it’s generally more efficient to only make rough level adjustments at first. Then, once you’re more confident of the placement of all your regions, go in and do the fine adjustments. After you make a volume change, listen to it. Fine-tune the breakpoints for a mix that sounds good to you. If the volume of a soundfile is too drastically low or high, you can make it a more average level by using “clip gain”. In the lower left corner of each clip is a small fader icon. Clicking on it gets you a larger fader to control the amount of gain to add or remove from the clip. Be careful: you can create distortion if you add too much clip gain. Watch the track meter at the left edge of each track to make sure that the level remains safe. Ideally, you’d like to see a healthy bounce in the green zone of the meter, a little bit of yellow on loud peaks, but no red indicators lit up. Clip gain is nice because it’s non-destructive — you can simply turn the gain back down if you’ve gone too far. Also, because it’s non-destructive, you can adjust the edges with the Trimmer tool. When there’s audio on either side of the clip borders, you can use crossfades to smooth the transitions where the gain has been changed. You can make a similar adjustment by selecting the region(s), then in the AudioSuite menu use the Other> Gain or Other> Normalize commands. “Gain” lets you increase or decrease the volume of a clip. “Normalizing” analyzes the track and raises its loudest peak to as high a level as possible before it would distort (or to a user-definable level.) These Audiosuite processes create a new soundfile, with the new volume applied. Using clip gain is often a better solution, because it remains adjustable. When you switch a track from “waveform” to “volume” display, you still see waveform, but with a line indicating the volume of the track. Or you can create a separate “lane” underneath the waveform to show volume automation (or other automation displays), leaving the main track in Waveform mode. Like a full-track volume display, within this automation lane, you can use the Grabber tool to click in new breakpoints, drag the volume level up or down, and Option-click to delete breakpoints. It’s always a good idea to have a Master Fader: use the Track> New… menu command, then in the New Tracks dialog screen, enter “1”, then select “stereo”, and “Master Fader”. A Master Fader’s volume meter shows the combined level of all the active tracks. If the audio on the Master Fader’s meters goes into the red, you must reduce the level on one or more tracks. If the master levels look low, you can raise the volume of your track(s). Auto Write writes continuous automation information for all your moves. Auto Latch only writes automation data when you change a parameter, and then leaves the setting where you last touched it. Auto Touch writes automation data much like auto latch, but instead of leaving the levels at your last adjustment, it returns the levels to the previous setting. This mode is useful for momentary ducks or boosts in a mix whose levels are otherwise consistent. Auto Read will play back any automation you have written, and Auto Off predictably will ignore all automation data. Unless you’re comfortable working this method, generally speaking, riding levels with a mouse on a computer graphic of a fader is a clunky way to control a mix, and usually generates much more automation data than is needed. A physical control surface, providing an array of faders and knobs is quicker and more intuitive, for those of us who learned mixing on an analog mixer. But it’s still less precise in both timing and volume levels. You can automate several channels together by making a Mix Group. When grouped, any automation will apply to all tracks in the group together. To make a Mix Group click on a track name, then shift-click on any other track names that you’d like to treat the same, then hit Command-G to make those tracks into a group. Name the Mix Group so you’ll remember what’s in it. You might later need to turn groupings on and off: the group’s name lets you identify it. Sometimes you want several tracks to change volume in unison — e.g., layered ambience tracks or several overlapping voices — but also need to still tweak the individual track elements. Making a Mix Group makes it easy to change automation data equally for multi-tracks, but hard to adjust a single element’s volume. You have to suspend the group, perhaps re-select a subgroup, make the change, and then reactivate the group. But, if you don’t like the change, it’s hard to get back to where you started. Here’s a more flexible and powerful track-grouping method: Send the outputs of selected tracks to a bus path (instead of directly to the main stereo mix). These tracks’ outputs then return to the main mix through an aux channel. You can automate this aux channel, or apply the same effect(s) to all the sounds at once. When several channels all need the same kind of compression, EQ, or reverb, don’t insert a plug-in on every channel; bus them together and insert one effect on the aux channel, where they return. This gives a consistent treatment to all the clips and saves processing power by reducing the number of plug-ins needed. A bus can be mono or stereo. If all the tracks are mono and can share the same stereo pan position, choose a mono bus. If you’re busing stereo tracks, or want the tracks to have individual placements in the stereo spectrum, choose a stereo bus. Follow the example above (a screenshot of a Mix window). You can see tracks 3–6 routed to “bus 1–2”, and “bus 1-2” the selected input of an Aux channel. Were tracks 3–6 all ambience, you could first balance the volume of the four ambiences to each other, then, with the level of the one Aux channel, duck them all under a narration or actuality. If all of the ambience had rumble or hiss, you could apply the same EQ plug-ins to just this one aux channel. To set bus paths on a track’s channel strip, click on the “output” box to select a bus, or pair of buses. Repeat for all channels you want to adjust together. Then create a new Aux Input track, mono or stereo. Click the “input” box of the new Aux Input track’s channel strip, then select the name of the bus(es), the ones where you routed the individual tracks. The selected bus of channels now goes first to this new aux channel, and from there to the main output. Treat this aux channel as you would any audio track — you can insert plug-ins, change the volume, and shift the stereo pan. 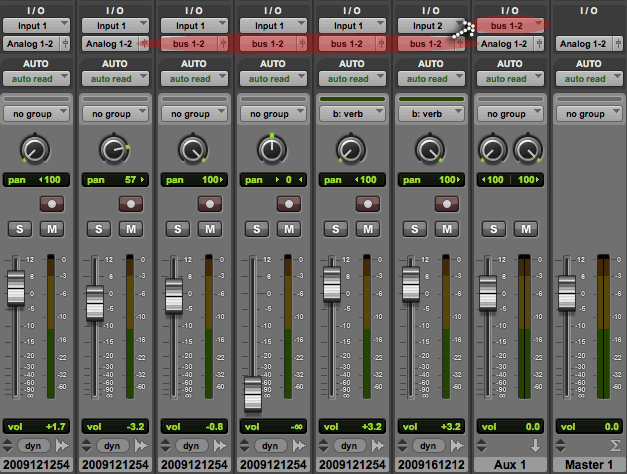 Adjustments to an individual audio track still affects that track (only); adjustments to the aux channel affect all its inputed tracks. In music mixing we use buses to simplify control of related inputs, like ten microphones on a drum kit. By routing these channels to the same bus, we can control all the drum tracks with a single bus fader, while still being able to change each drum mic sound separately. Inserting an EQ or compressor on the master fader can bring a mix together in a way individual track adjustments cannot, but be gentle with any effects applied to the Master fader. 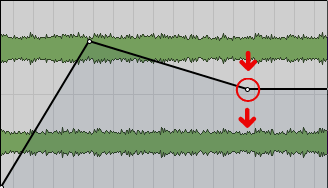 If a specific clip has unique problems, apply plug-ins only to the track it’s on. Often it makes sense to put a problem clip on its own track. Rumbles, hisses or extreme volume peaks are better dealt with on specific channels, or if shared by several tracks, on a bus. A compressor on the Master Fader can unpleasantly squish background sounds when one track gets excessively loud. You can be more aggressive with compression or EQ on an individual track, then use a gentle gain-controlling compression and peak-limiting, with overall EQ smoothing on the Master Fader. With or without effects, remember that all the tracks interact. Sometimes the way to make an element more prominent in the mix, rather than turning it up, is to reduce the level of the other tracks. In music mixes we routinely make room for a primary sound by EQ-ing background sounds to clear out competing frequency ranges. Always use your ears to decide what’s right. Digital editing programs have tremendous power, providing visual feedback to help make mixing decisions. 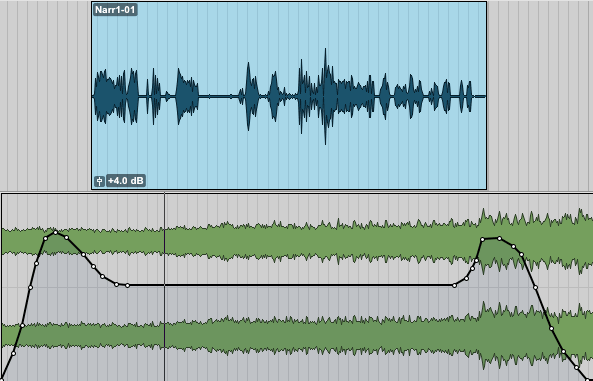 But it doesn’t matter how lovely your automation curves look, it matters how your mix sounds. To create a standalone audiofile of your final mix, with all of the editing, processing and mixing you’ve added to your session, you need to use “bounce to disk”. Highlight the part of the session you want to bounce by click-and-dragging on the timeline ruler (or in a track with the Selector tool). Typically you will select the entire session but you can select a shorter subsection. When you’re ready, use the File> Bounce to> Disk… menu command. This brings up the Bounce dialog screen. In most cases, you’ll want to bounce to a high-quality, uncompressed audiofile to save as your “master”. You can always make other versions of the mix: smaller file size for web distribution, or a particular file type for a special use, such as a Podcast, which must be either an MP3 or AAC file. In the Bounce screen, make sure the “Bounce Source” is set to whatever your main audio outputs are, in most cases that’s “1-2 Stereo” or something similar. The File Type should be “WAV”; the format should be “Interleaved”. The Bit Depth should be “16 bit” in most cases. The Sample Rate should be 44.1 khz for most audio projects and 48 khz for video projects (the audio-for-video standard). 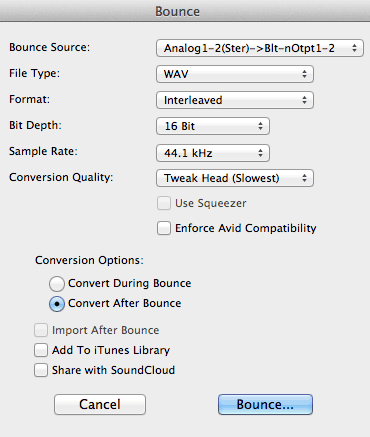 Once you’ve selected the appropriate settings, click “Bounce”. In the subsequent Save dialog screen, you are asked to name your audiofile and select where to store the saved file on your computer. Once you’ve chosen the name and location, click “Save” and the bounce will begin. In Pro Tools 11+, this bounce happens faster than in real-time; in Pro Tools 10-, it happens in real time and you will hear your session play back during bouncing. One note: in order to get a “Bounce to Disk” export to happen faster than real time in Pro Tools 11, you have to check the box that says “Offline” in the lower left of the Bounce dialog box. Otherwise Pro Tools 11 will bounce in real time just like version 10. The faster bounce has been a life-saver for working on multiple versions of long-form radio programs! I am using Pro Tools LE v8. 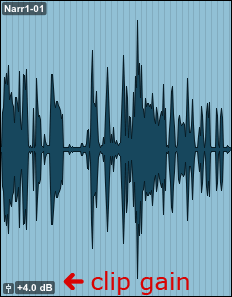 Suddenly recorded volume level comes in at 23 rather than usual 6 which is what I need for voice over work. Robbie Blue mic preamp untouched, MBox Mini untouched. Maybe I touched a control by accident but I cannot find it. Also playback or record will not start from where I point the cursor. Any suggestions? Exactly what I need for a reference, thanks a bunch!